After brushing Cork aside, league leaders Dundalk have three players in our latest XI. 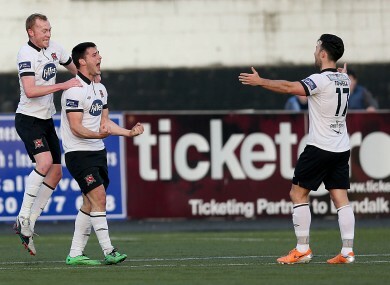 Dundalk's Paddy Hoban celebrates with Chris Shields (left) and Richie Towell (right). Stephen McGuinness (Bray Wanderers) – A solid display throughout was capped by a crucial penalty save that salvaged a positive result for Bray at Athlone Town stadium. Ian Bermingham (St Patrick’s Athletic) – There was a rare goal for the Saints full-back on Saturday as he fired past Gary Rogers having been picked out by Christy Fagan. Also got forward to win Pat’s a penalty. Samuel Oji (Limerick) – Limerick’s solid central defensive partnership of Samuel Oji and Stephen Folan continue to impress. Oji was excellent throughout Friday’s eventful draw with Shamrock Rovers at Tallaght Stadium. Andy Boyle (Dundalk) – The Premier Division leaders put four past Cork but also kept a clean sheet against the Rebels with Boyle playing a key role in defence. David Cawley (Sligo Rovers) – The 22-year-old was at the centre of everything for the Bit of Red, and controlled midfield. James O’Brien (Athlone) – The Athlone central midfielder was a real live wire throughout this tie and was at the heart of all their best attacking play against Bray. His astute pass set up the penalty chance, while he was also excellent off the ball, both making support runs and in the tackle. Robbie Benson (UCD) – The versatile midfielder has matured incredibly this season with the added responsibility as captain. He was in the right place in the right time to capitalise on a defensive slip and showed great composure to slot into the corner. Darren Meenan (Dundalk) – The winger was among a trio of key players recalled and he didn’t disappoint. With Pat Hoban in form, Meenan’s expert crossing caused panic in the Cork ranks. Rory Gaffney (Limerick) – The Tuam native headed a fine first half goal for Limerick and was excellent ploughing a lone attacking furrow against Shamrock Rovers. An immensely promising player Gaffney is gaining plenty of new admirers in the top flight. Pat Hoban (Dundalk) - Winning everything in the air, the Galwegian was relentless all evening at Oriel Park. It was no surprise his two goals were headed efforts. Jason Byrne (Bohemians) – Veteran striker Byrne moved another step closer to Brendan Bradley’s record with an excellent left-footed strike into the top corner to end a brilliant move.